This posture combines a lengthening of the hamstrings with the first spinal twist in the Ashtanga-Vinyasa series. Practice of this posture will increase the flexibility of the hamstrings, the mobility of the spine, opening of the shoulders, and ability to balance. From Samasthiti*, inhale and step your right foot back ~3′ and pivot the body 180°, bringing the hips square towards the rear of the room. Turn the left foot out slightly to the left – 15° if your hips feel relatively tight or you have trouble balancing, and 45° at most. Bring the right heel in line with the left arch (see alignment section below for more on how to pick your stance). Raise both hands to the sides, parallel with the floor. Bring the right hand to the hip and stretch forward through the left hand, reaching towards the back wall as you lower your torso until it is parallel with the floor. Rotate the hips anteriorly (‘lift’ the buttocks’) as much as possible, lengthening the hamstrings fully and preventing the lumbar spine from curving. Do not begin to twist before you are sure that you have flattened your back – combining twist with a rounded back is a recipe for back pain, especially in positions such as this when the lumbar spine is lifting the weight of the upper body. If you are unable to maintain a neutral spinal curvature here, lift your torso upright until you can flatten the back (as shown in the right-hand picture above). Lift your navel towards the spine and tuck the rib cage into the abdominal muscles to support the spine and relax the muscles of the back. Exhale fully as you take the left hand to the outside of the right foot, placing the palm fully on the ground (above left). Alternatively, place the back of the left hand against the outside of the right leg as high as necessary to maintain proper spinal alignment (above right/variation 1). Lift the right hand towards the ceiling, opening the chest to face the side as the right (top) shoulder rotates up and back and the left shoulder presses forward. If possible, the right wrist should be aligned, floating over the center of gravity. Gaze towards the top thumb, lengthening and twisting the neck. Hold here for 5 breaths, then lift to a standing position; pivot 180° and practice on the left side. Low back pain / spinal injury – practice with doctor’s counsel and a qualified instructor. Correct posture is essential in this case to prevent a worsening of your condition. If you have neck pain or a cervical spine injury, do not lift the left hand; keep it on the back or waist as pictured above; do not twist the neck to look upwards. Torn or tender hamstrings: Practice this posture lightly or bend the injured leg at the knee until the hamstring heals. Taking the full position and stretching at your maximum will reinforce the injury – stretch at 30-50% of your capacity, gently lengthening and stimulating the muscle but not lengthening it fully. Shoulder injury: modify hand position as necessary. If the top shoulder is painful, rest that hand on the lower back. If the bottom shoulder is painful, do not place any weight on it. Instead, use it only to help guide the torso. *Reference Surya Namaskara A for discussion of Samasthiti. Also, advanced practitioners may prefer to transition into this asana from Trikonasana rather than returning to Samasthiti. There are many triangles to be found here. 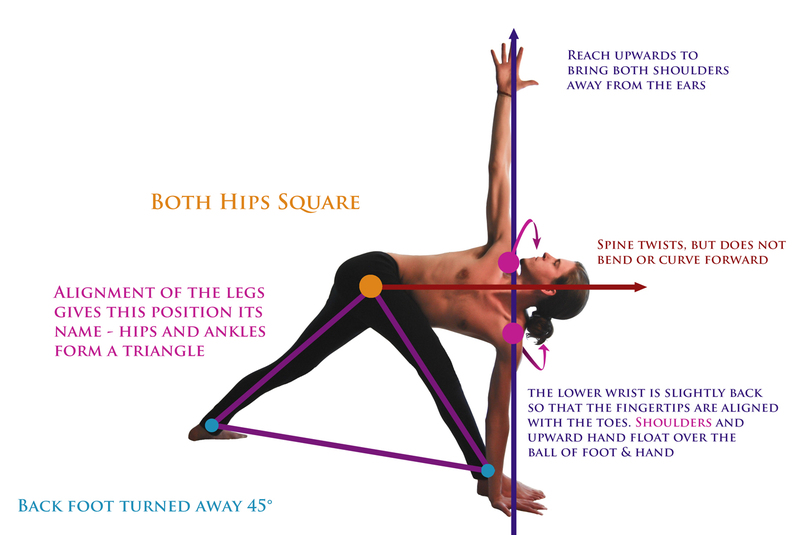 The main triangle is formed by the position of the ankles relative to the hips. 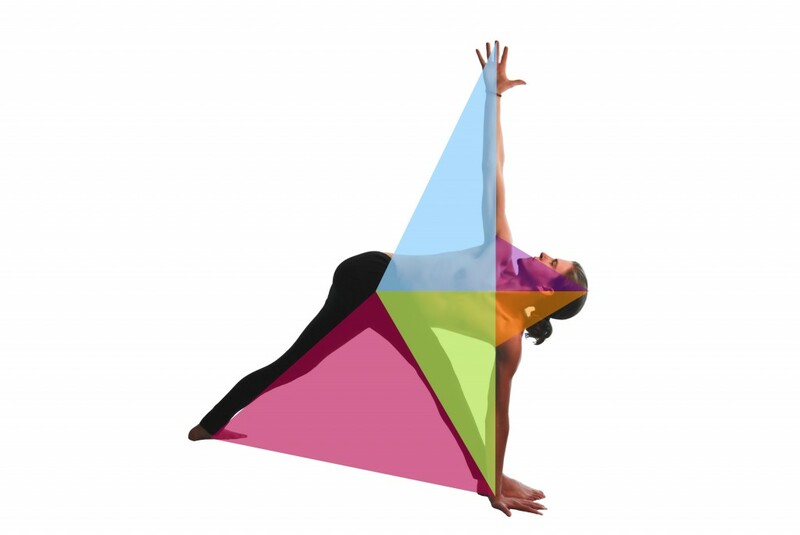 This positioning creates a relatively equilateral triangle, though the base may be somewhat shorter than the sides depending on your stance. How to pick your stance: This is something that you will have to feel into. In a perfect world, the stance is exactly the same as Trikonasana, and you simply rotate the left foot in 45°; that will take quite a bit of flexibility and strength. If you’d like to ease into it, start with a gap of 2-3′, feet hip width apart. If you have very flexible hamstrings and hip muscles, a longer stance will allow you to bring your hips lower and place your palm on the ground, but it will be more difficult to balance and will be a much more intense stretch. Conversely, a shorter stance will be easier to balance, but may limit the ability of the hips to rotate fully, leading to a rounding of the back. If your hamstrings are tight, start with the feet closer together and gradually take a longer stance. In a shorter stance, do not try to bring the palm to the ground (your back will round), instead, twist the spine while keeping the hand on the outside of the shin (see variation 1 below). If your palm is on the ground, work towards creating a stance that brings the sacrum level with the crown of the head — the level of the head is dictated by the length of the supporting arm. Depending on your sense of balance here, you may adjust your feet narrower so that the right heel is aligned with the middle of the left arch. A wider stance will make it easier to balance, but bringing the feet more than hip width apart will limit the mobility of the pelvis somewhat, and you will not be able to perform the posture as deeply, experiencing less beneficial effect from the lengthening of the hip abductor muscles and a full twisting of the spine. Now you will need to decide how much to rotate the left foot. Be mindful that any rotation comes from the hip and not the knee. Rotating the knee by turning the foot and lower leg out at a greater angle than the upper leg will shear the knee joint and can create instability in the joint over time – the knee is poorly designed for rotation. Stay at 0° if you have knee pain or your hip abductor muscles are very tight. Keeping your hips fully square, rotate 15-45° as you gain flexibility in the rotational ability of the hip. Keep the heel firmly on the mat. The benefit of having the left foot rotated at a 45° angle is that it this motion begins the spinal twist in the pelvis by creating space around the sacrum by opening the left hip and allowing the base of the spine to twist slightly (~1-2°). By keeping the leg engaged after it has been turned out (imagine rotating your femur and leg away from your body and lifting the leg off the ground to the side), you will activate a small muscle called the piriformis, which connects the left femur to the left side of the sacrum. Normally, this would help to move your leg relative to your pelvis, lifting it and rotating it outward. Since you’ve firmly planted your foot on the ground, your leg can’t move and so the contraction of the piriformis will slightly rotate the sacrum to the left, beginning your twist. Even though this motion is slight, it allows the twist to spiral up the spine from the coccyx all the way to the atlas (where the spine connects with the skull). Beginners, then, can take a hip-width stance with the left toes turned out about 25 degrees, or however much rotation can be supported by the flexibility of the thigh up to 45 degrees. Over time, as the ability of the thigh to rotate externally develops further, the left foot turns out more and more and the left foot comes back towards the line of the right second toe/heel. Variation 1: Shorter stance, 20° rotation of left foot. Tightness in the hamstrings is preventing the palm from reaching the ground, but the back remains straight and stable during the twist. Parivrtta Trikonasana challenges the hip abductor muscles (on the outside of the hip and thigh) on both sides. There are two correct hip positions here: hips completely square, or the hips squared front/back while the right hip lifts vertically, twisting the entire pelvis to provide a stable support for the twisting spine. The right side will stretch and lengthen – this may be felt all the way down the outside of the leg. Keeping the hips square is advisable for beginners or those who have tight hip abductor muscles, who may choose not to pivot the left foot outwards. Once your left foot has begun to turn out to a larger degree, start gently twisting the hips; you will feel the stretch on the outside of the right leg intensify. If tightness is present, the body will attempt to compensate by moving the hips away from alignment in one of two common ways: left hip moving back, opening the groin to the side, or left hip lifting above the right. Use a mirror, friend, or instructor to get feedback on your hip positioning. You may need to return to a neutral position, align the pelvis, and then move back into the pose as you keep full awareness on the hips. When the position is correct, you will feel a very intense sensation ‘deep’ in the pelvis. The left (back) hip may move behind you and open the groin to the left side in the opposite direction of your spinal twist. 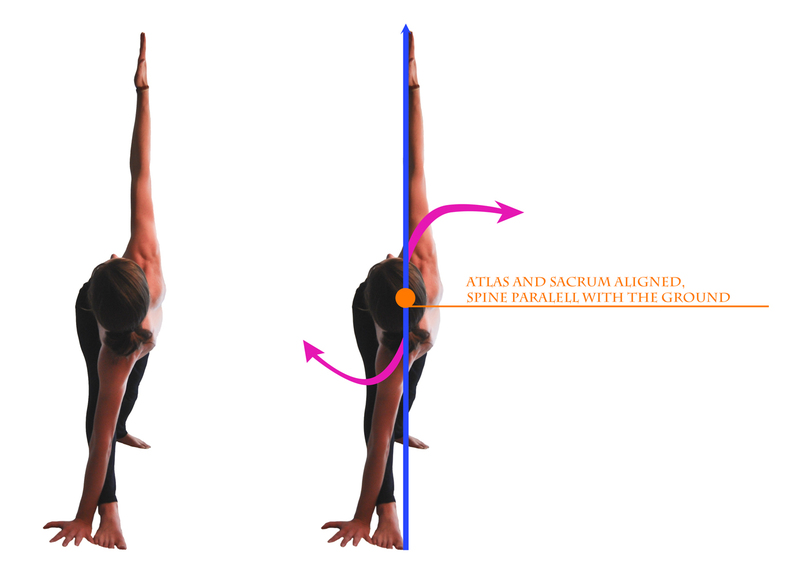 This movement is limiting for the position as a whole because it pulls the hips out of alignment, torquing the sacrum and lower back and limiting mobility in twisting — the left hip will pull the left side of the spine upwards and back, when it needs to be pressing forward and down into the twist. Address this by 1) shortening the stance slightly, 2) reducing the angle that the left foot is turned out, 3) using the hands to rotate the left hip forward and the right hip back. Imagine ‘sucking’ the left femur into the hip joint. Alternatively, you may find that your hips are not aligned vertically. If the left hip is lifting above the right, press the left heel firmly down into the mat. Use the muscles of the pelvis (or your hands) to bring the hips into alignment, engaging the core to pull the hip down. Lifting on this side is not recommended because it twists the sacrum and perhaps even some lumbar vertebrae in the opposite direction of the upper sections of the spine, creating more tension in the lumbar back and reducing mobility. The right hip is lifting above the level of the left is synergistic with the spinal twist, allowing the sacrum to gently twist to the right as discussed above. Another important triangle to be aware of is created by the two shoulders and the crown of the head. Keeping the shoulders relaxed and engaged will create a 90° angle between the spine and the shoulders.The atlas, the vertebrae at the top of the spine, is at the same height as the sacrum (base of the spine), bringing the spine parallel with the floor. The shoulders must remain active here – if do not actively lift, gravity will pull your right shoulder down towards your ear and your entire upper body will collapse down into the left arm. Press firmly into the mat, but do not rest your weight on the left hand. Lift the upper body away from the left arm, and stretch through the right fingertips to raise the right arm away from the upper body. As pictured above (front view), the shoulders play a very important role in twisting the spine – use the leverage from the left hand against the mat to gently guide your spine deeper into the twist. Rotate and lift the right shoulder to open the chest fully to the side. Elongate the spine, stretching through the crown of your head; pull the torso away from the hips and the head away from the shoulders, attempting to lengthen the spine and creating space between the vertebrae as they twist. It can be seen that there’s quite a disconnect here, with a much greater rotation at the hands than at the spine. The action pictured in the hands not only distracts from rotating the spine, but actually creates a further misdirection of force: the right (top) hand is falling back towards the ground behind the torso, serving to increase compression in the shoulders, in the shoulder joint itself, but also a collapse of the shoulders around the neck. Try instead to keep the arms in line with the collarbones (red line in above picture) and to “twirl” from the collarbones, creating the movement closer to the spine. Let the arms be dragged along into alignment by the movement rather than being the initiators of the rotation. Then reach the right fingers skyward to broaden the space around the neck. This, in turn, serves to create ease in the spine by reducing pressure and compressive weight, allowing a deepening of the rotation and elongation of the spine. This correction will typically guide sensation away from the upper body and into the center of the pelvis and down the outside of the legs. The spinal twist primary to this pose ought to begin at the sacrum, with the rotation of the pelvis. The sacrum and lumbar sections of the spine have very limited rotational ability, so be sure to use proper hip alignment to get at least a few degrees of rotation from each of the lumbar vertebrae – pelvic imbalance will lock up the lumbar spine or even twist it in the wrong direction. Of the 4 sections of the spine, the thoracic (the part connected to the rib cage) has the most capacity to twist, and thus the majority of this motion will come from a rotation of the upper body. Focusing on ‘opening’ the chest to the right side will help you twist. Finally, the cervical spine (neck) continues the twist by looking up at the raised thumb. Again, this pose is concerned with the hips and the twist of the spine. Bringing the hand to the ground is unimportant. Keeping your spine straight and your pelvis stable is the main focus. Regular practice of this posture will increase the flexibility of the hamstrings, the mobility of the spine relative to the hips, the ability of the spine to twist, an opening of the shoulders, ability to balance, and strength in the knee. If you have knee pain or challenge your knees regularly (runners or cyclists, for example), practicing this posture in conjunction with Utthita Trikonasana will do wonders for loosening the knee joint and preventing or eliminating pain.